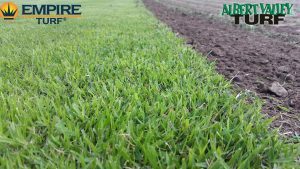 Albert Valley Turf grows Empire™ Zoysia at our farm at Tamborine. Empire™ Zoysia has become one of the most popular lawn turf varieties Australia wide for excellent properties and its highly desirable look. Zoysia grows quickly across the ground for better wear tolerance but grows slowly vertically limiting the amount of mowing required immensely. Resercher’s have found Empire™ Zoysia needs one third to half the mowing requirements compared to Kikuyu and Couch grasses. It also requires less edging and is a safer choice for steep slopes and retaining walls as its deep root system strengthens the soil significantly. Empire™ Zoysia has a huge rhizomes system which make the strongest and easy to handle turf slabs as well as providing unmatched survivability . It has a medium size leaf blade, which rolls up on itself under dry conditions, exposing less leaf surface when in contact with dry air. This is all part of its drought tolerant mechanism which make it a perfect lawn variety to have in South-East Queensland during warm humid conditions. Another great quality is it’s resistance to Army Worm and Web Worm which are types of lawn grub that can severely damage your lawn if left untreated. 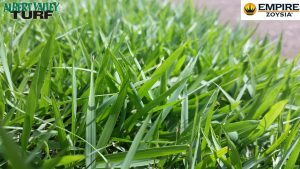 It also has the ability to out-compete weeds as well as resist certain weed types making Empire™ Zoysia a fantastic lawn to choose if you are looking to do minimal maintenance. Empire™ Zoysia is soft to the touch and maintains a deep, green colour in every season. It is suited to residential, commercial, roadside and amenities areas and will tolerate full sun and between 50% to 30% wear, depending on traffic. It is also drought and cold tolerant. Albert Valley Turf has been operating for over twenty years. We also supply Sapphire® Soft Leaf Buffalo, Wintergreen Couch and Oz Tuff® Couch. We have an experienced landscaper on-site who can assist you to make the right decision for your garden and we offer delivery and turf laying services. Do you want to know more about Albert Valley Turf’s supply, delivery and turf laying services? Please contact us today.